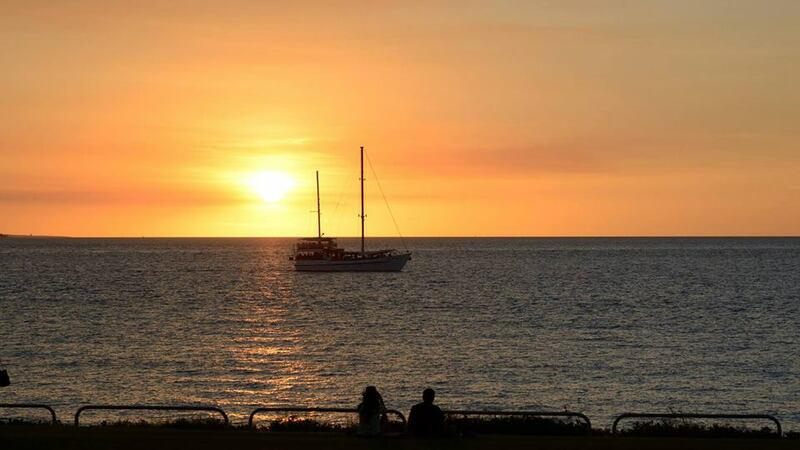 This is a continuation of camping trip at Darwin, Northern Territory. 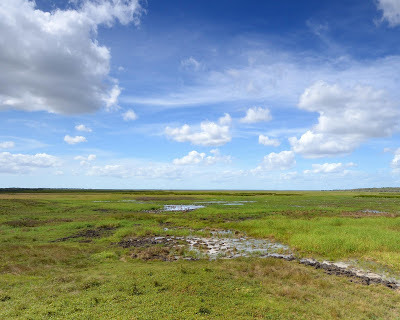 Previously, we drove from Darwin city to Kakadu National Park. Spent 2 nights at Cooinda Lodge exploring the wildlife at Yellow River billabong. Afterwhich, we dropped by Jairu town. And here, we camped at Mary River Caravan Park before heading back to Darwin city. It was a beautiful morning. 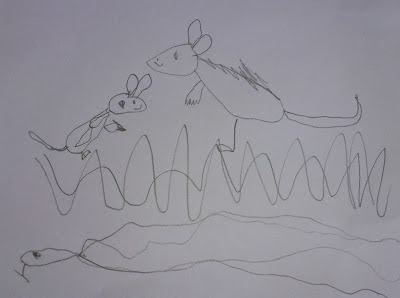 My son was elated to spot a few wallabies hopping around the camp toilet and started to follow them. But they were very sensitive to humans and yet seemingly not aggressive. As soon as we got too near to them, they sped off. 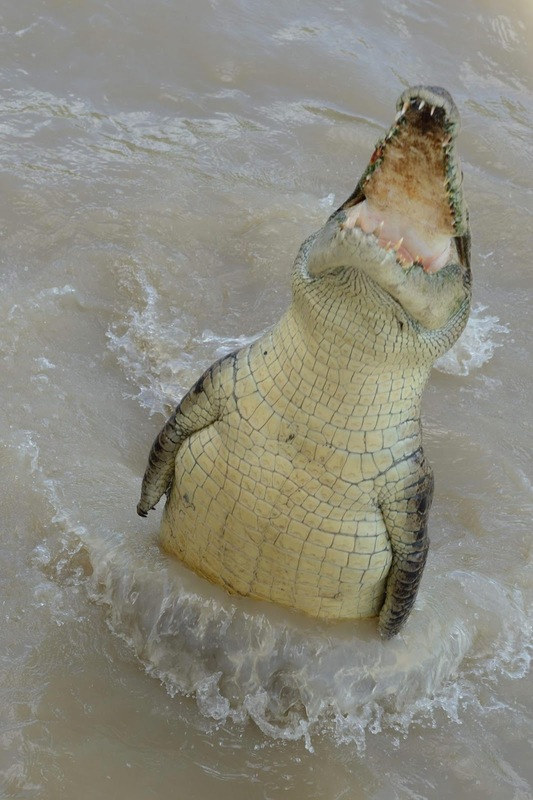 Our next adventure was to experience the jumping crocodile cruise ran by Adelaide River Queen Cruise. These dangerous reptiles were enormous! 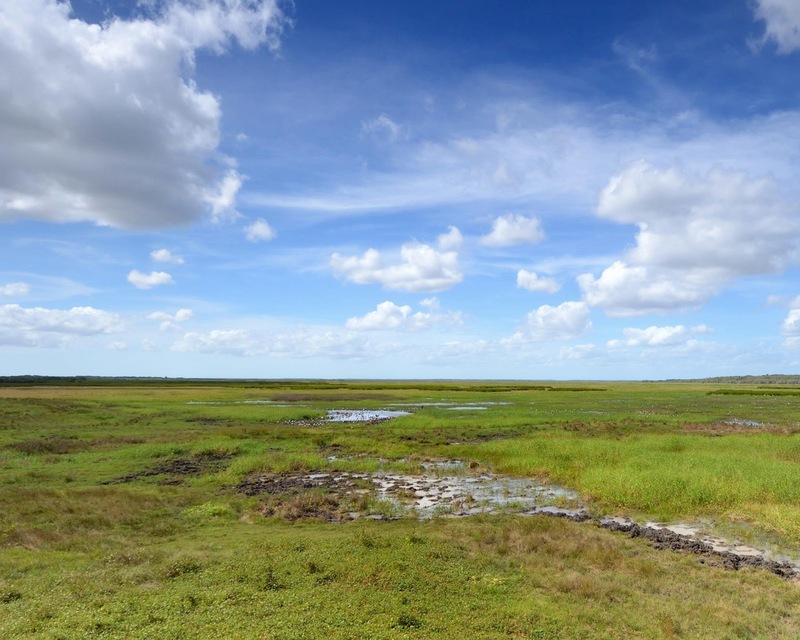 The cruise member dangled chunky 'pork chop' from the open air canopied upper deck, above the murky water enticing the crocodiles to jump for their meal. This provided those seated at the enclosed air-conditioned lower deck a real close up view at these ferocious crocodiles. At the upper deck was equally exhilarating, we could see these crocodiles jumping in action and also, hand feeding of whistling kites. The birds of prey grabbed the feed as the cruise member threw chunks of meat in the air. It was awesome! After a light lunch with sandwiches and toasties at the cafe, we drove to Fogg Dam Conservation Park - a place to experience birdlife. A visit to Windows of Wetlands visitor centre also enlightened us and identified the species of birds we saw. Another warm, windless and humid night. Last day at Mary River, we were hesitated to take another wetland cruise at Corroboree billabong since we had done it at Yellow Water in Kakadu National Park. In fact, we were supposed to book the tickets in advance but we did not. When we reached the boat ramp, the boat has already left five minutes ago. So we called the ticketing phone line and was not hopeful at all. To our surprise and unexpectedly, the operator actually arranged for the boat to turn back and pick us up. Thumps up for the excellent customer service (which we should learn). And we were glad that we did it. 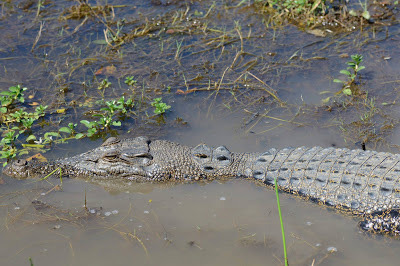 Saltwater crocodiles were just less than three feet away from our boat. 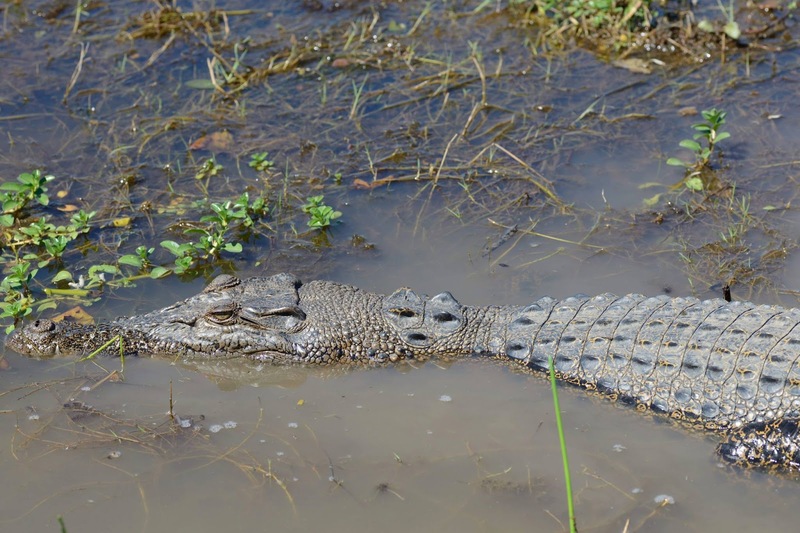 These reptiles were not as aggressive as those at the Jumping Crocodile Cruise. They were motionless and sedate. 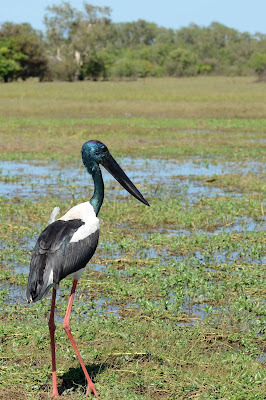 And at last, we saw the Black Neck Stork (or Jabiru) which we made the paper plate craft prior to this trip. Magpie geese, Herons and other similar birds (which we had seen at the Yellow Water Cruise) were spotted. The guide even plucked a piece of lily leave, filled it with water and told us that the aboriginals used it to shelter from rain and serve as a cup for drinking. It was both informative and educational cruise. It was lunchtime when we finished the cruise. Papa suggested we went to Humpty Doo Hotel for its triple burger which consisted of buffalo, crocodile and barramundi - exotic meat! As a matter of fact, the place was recommended by the guide at Jumping Crocodile Cruise. It was a long journey and we snacked on Uncle's Tobys chocolate chewy bar on the way. We did not know it was a pub and could get a little rowdy among the drinkers. We were there for the food and hence, it did not bother us very much. Just keep a distance. Burgers were really good! I preferred crocodile and barramundi over buffalo as the latter was quite tough. With a happy belly, we headed back to the capital city, Darwin. Next on our itinerary was Aquascene fish feeding at Doctor Gully Road. 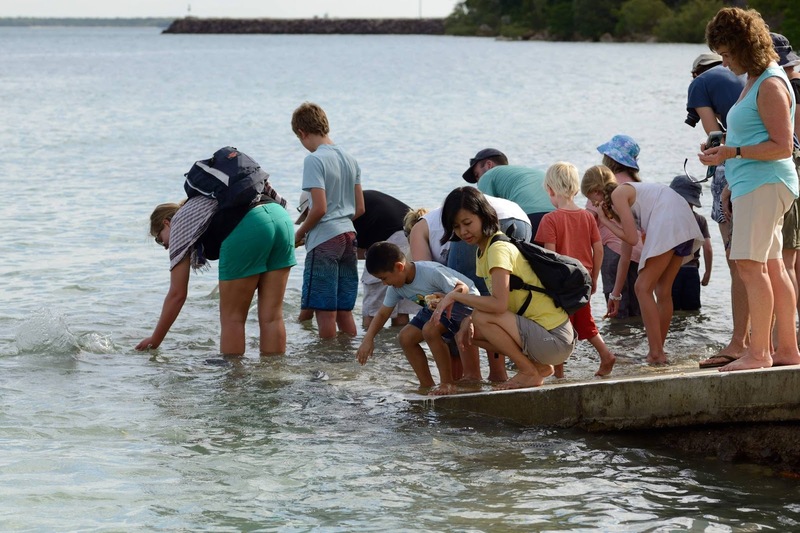 A must do activity in Darwin. Fishes would swim to shallow shoreline at high tide for hand feeding. Each person was to take only two pieces of bread at one time. Children and adults alike absolutely loved it! My boy went for many rounds of feeding and even touched the fishes. There were mostly milk fish and diamond fish. We even got a glimpse of an gigantic rock cod in the deep water area. We were back at Lee Point Caravan Park in the evening. No more cooking at the camp kitchen. We treated ourselves to a Japanese restaurant at Casuarina Shopping center. It was a Saturday night and the place was buzzling with shoppers. Indo Pacific Marine - As the name suggested exhibits the natural eco-system of the coral reefs of the Darwin Harbour. We watched a rather long film about marine life and coral reef in Cairns, Australia. Then, we were ushered to a large reef tank that was totally self-supporting - no feeding, filtration or water changing. The guide shared his knowledge generously. My son was intrigued by the boxing shrimp clicking sound and some fishes in the tank. And the barramundi pool where he hand fed it. It was educational and informative but can be really bored for young active children. We had fish and chips, mix of seafood at Darwin Fishman's Wharf Eatery for lunch later. Yeah, the aussie's style! In the afternoon, we explored Darwin wharf/waterfront precinct. Plenty of fine dining options. People cooled off the heat in the wavepool and recreational lagoon. We promised my son we would come back tomorrow morning for the wavepool since we were not prepared. He was reluctant to go without coaxing. Boy, he loves waterplay!! Next, we visited Museum & Art Gallery of the Northern Territory. Excellent exhibits of Aboriginal arts, Cyclone Tracy, the saltwater crocodile known as the 'Sweetheart' and Aussie wildlifes. 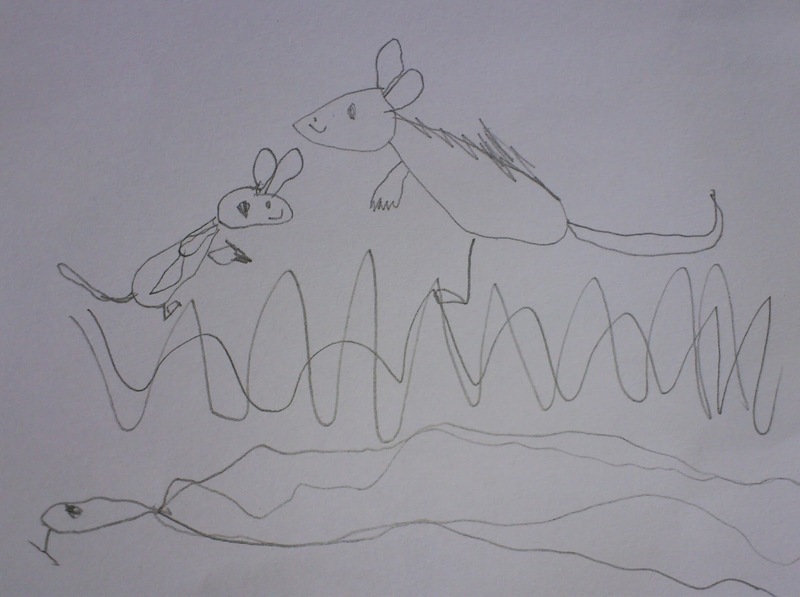 My son has a great time at the museum and drew kangaroos back home mimicking aboriginal arts. What do you think? Lastly, we decided to have dinner at Cullen Bay. A place for waterside lifestyle living and a host for many fine and casual restaurants. We settled for Seafood on Cullen overlooking the lawn where people brought their picnic mats and chairs to view the beautiful sunset. The restaurant offers a good variety of seafood and Asian dishes in buffet style. The hottest dish was mud crabs cooked with chilli sauce which was quickly snapped up as soon the staff replenished it. We went to the buffet spread a few rounds and it was still empty. Nonetheless, we did taste crab in the end. Sunset was magnificient! 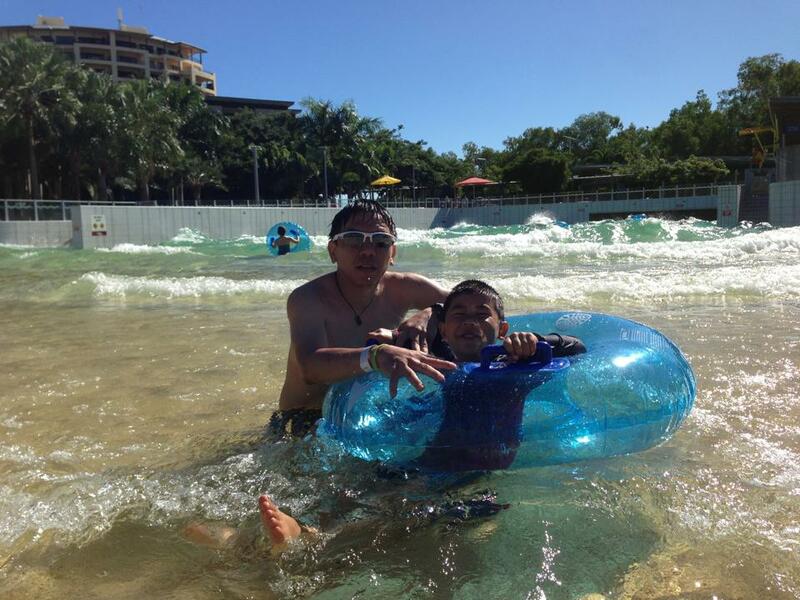 As promised, we went back to the wavepool in the morning and we had a blast there. My boy has so much fun riding the wave on a float. At one point, hubby let go his grip of the float for some thrill and the huge wave literally threw my boy off the balance. (My boy does not know how to swim yet.) He was lucky that a lady/lifeguard grabbed him and passed to me. He struggled a little in the water but did not scarce him to go for it again. He was calm and did not cry. My heart almost stopped pumping to witness such as frightening scene. We ended our trip at the wavepool and took an afternoon flight back to our home in Singapore. Despite the misadventure, my boy still loves his first camping trip in the Northern Territory and even wanted more. It was our second visit, however. 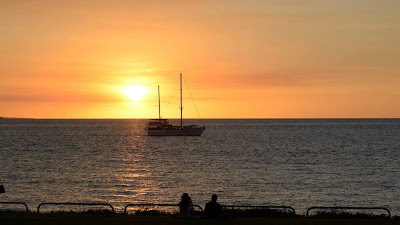 We had visited Darwin when we were in our 20s, a stopover for a few days before heading to Cairns. The wavepool was not even there yet. Darwin has developed so much and its façade has changed giving way to several high rise apartments. A norm as most city grows.